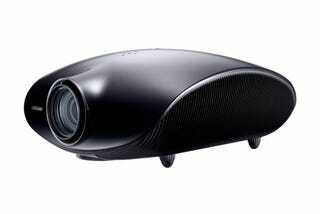 We bet Stormtroopers wouldn't mind crowding around Samsung's latest 1080p projector, the SP-A800B. It makes use of TI's newest DLP chip, delivering a 24fps film mode and a 10,000:1 contrast ratio. No price or street date, but since it's an "ultra high-end model targeted to the content creation industry and home theater," we're guessing the price will suit the audience. Two more snaps and full specs after the jump.